An ad for The Paris Metro, gone for 40 years but not forgotten. 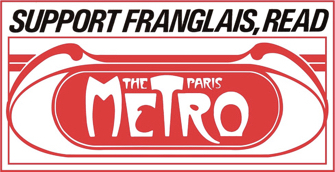 It only lasted a couple of years, but the fortnightly newspaper The Paris Metro (1976-78) left its mark on Paris’s expatriate community and spawned many talented writers, editors, photographers and graphic artists who went on to leave their own mark on publications around the world. The alumni of the newspaper recently celebrated its 40th anniversary with a bang-up party and the publication of a book – The Paris Metro 40th Anniversary Issue: The Book About Paris Yesterday (Freelance Ink Books; available on Amazon) – an unusual chunk of Parisian history in which 50 alumni of the paper and readers time-machine back to the golden years of their youth in 1970s Paris. The 50 contributions to the book answer those questions and many more, including how and why it was founded by 20-something New York journalists Harry Stein and Thomas Moore (inspirations included a shared adoration of Jean Seberg in the film Breathless, Moore’s French girlfriend, and, of course, that abiding “American love affair with Paris”). With the help of a small nest egg and side jobs for other publications, the pair set off for the French capital, found space in a beautiful hôtel particulier in the heart of the Marais, and founded a newspaper with all the insouciance of feckless youth. While covering fashion, politics and social issues (French workers, Africans in Paris, etc.) and scoring interviews with luminaries like Henry Miller (who posed for a photo with a naked blonde) and Henry Moore, the paper also catered to the pressing needs of expatriates in Paris (such as where to get the best ice cream in Paris, published during a heatwave), along with restaurant, film and art reviews and shopping tips. It also provided in-depth investigative reporting (e.g., Stratte-McClure’s exposé of what it was like to go swimming in the Seine). John F. Kennedy’s former press secretary Pierre Salinger even contributed a column on politics. The experiment failed after less than three years, but proof of its lasting influence can be found in the fact that so many contributors and fans hold a special place for it in their memories and were ready and willing to relive its glory days by attending the party and writing their memoirs for this book.